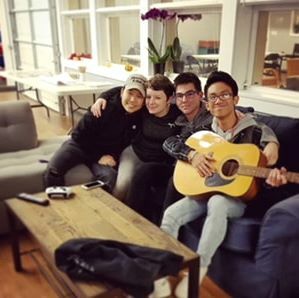 ​ At The Garage, our mission is to create a safe after-school drop-in place for high school teens where they can meet friends and access programming and services as needed.​ It's a place where students develop and implement programming and really "own" the space. We've been working for more than three years to make this idea a reality . As you can see, it's all coming together, but we can use your help! Your donations are always welcome and appreciated and will go directly to supporting the teens in the greater Issaquah area! Reserve Our Conference Room, Or Stage! WE ARE NOW LIVING THE DREAM OF AN ISSAQUAH TEEN CAFE COME TRUE. THE GARAGE (FORMERLY ISSAQUAH TEEN CAFE) OPENED ON SEPTEMBER 22. OUR SPACE, LOCATED AT 235 FIRST AVENUE SOUTHEAST IN DOWNTOWN ISSAQUAH, WAS GENEROUSLY PROVIDED BY THE CITY OF ISSAQUAH, AND WE THANK FRIENDS OF YOUTH FOR THEIR FISCAL SPONSORSHIP. A HUGE THANK YOU GOES TO ALL OUR AMAZING PARTNERS AND DONORS INCLUDING THE KIWANIS CLUB OF ISSAQUAH, THE ROTARY CLUBS OF ISSAQUAH AND SAMMAMISH, THE STATE OF WASHINGTON COMMERCE DEPARTMENT AND MANY INDIVIDUAL DONORS WHO HAVE PROVIDED THE FUNDING TO MAKE THIS HAPPEN. ALL TEENS, 9TH GRADE TO 12TH GRADE, ARE WELCOME! !